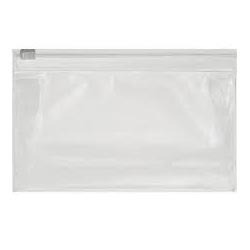 Outfitted with a modernize infrastructure, we have established ourselves as the prominent manufacturer and supplier of high quality assortment of Transparent Zipper Bag. Known for its high quality, this zipper bag is attentively manufactured using high grade material and ultra modern machines in sync with the set norms. Provided zipper bag is offered in numerous sizes to meet the diverse desires of packaging. Newly started at Ahmedabad (Gujarat, India), we “Anjani Plastic Industries”, are reputed Manufacturer and Supplier of wide array of Zipper Bag, Zip Lock Bag, Plastic Zipper Bag, Colored Plastic Zip Lock Bag and Printed Zip Lock Bag. The offered bag range is manufactured using best quality material that we procure from the dependable vendors of the industry. Also, we use sophisticated machinery and technology in the manufacturing process of these bags. These zipper bags are used to pack products and highly demanded due to moisture resistance, tear resistance and perfect finish. Additionally, we offer zipper bags in different size, grade and can also be customized as per the specific requirement of our clients at affordable price. Owing to our fair business policies, timely delivery, nominal price range and client-centric approach, we are constantly increasing client base across the country.